Major Michael Manning, Troop A Commander, New York State Police, recently presented Jason Walczak, of Blasdell, New York, with a framed Certificate of Appreciation and a Florida Highway Patrol Leadership Coin, for his quick and decisive actions that were instrumental in obtaining emergency medical services and treatment for FHP Corporal Daniel A. DeWeese (picture and story below) after he was struck by lightning. At approximately 12:25 p.m. on Saturday, March 26, 2005, Corporal DeWeese was investigating 2 separate traffic crashes southbound on Interstate 75 near the 386 mile marker in Marion County. While standing outside by one of the driver’s vehicles in the grass median, lightning struck Corporal DeWeese, throwing him into the air and knocking him unconscious in the grass median. Several civilians that Corporal DeWeese was conducting business with, including Mr. Walczak, witnessed what happened and immediately called for help on Corporal DeWeese’s radio. At one point, Corporal DeWeese appeared that he was not breathing, so witnesses removed his shirt so it would not restrict him. The Florida Highway Patrol is grateful for the assistance Mr. Walczak provided to Corporal DeWeese, and also thanks the New York State Police for helping us recognize him for his lifesaving efforts! 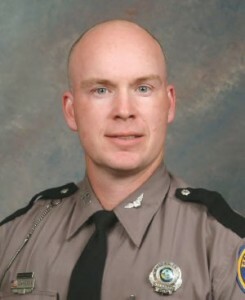 At approximately 12:25 p.m. on Saturday, March 26, 2005, Corporal Tony DeWeese, Troop B-Marion County, was investigating 2 separate traffic crashes southbound on Interstate 75 near the 386 mile marker. While standing outside by one of the driver’s vehicles in the grass median, lightning struck Corporal DeWeese, throwing him into the air and knocking him unconscious in the grass median. The civilians that Corporal DeWeese was conducting business with witnessed what happened and immediately called for help on Corporal DeWeese’s radio. At one point, Corporal DeWeese appeared that he was not breathing, so witnesses removed his shirt so it would not restrict him. Marion County Fire Rescue, members of FHP, and Marion Sheriff’s Office deputies responded to the scene. Corporal DeWeese was transported by ambulance to Shands Hospital in Gainesville and admitted for care. The lightning struck Corporal DeWeese near his neck and shoulder and the energy exited through his feet. As a result of the lightning strike, Corporal DeWeese suffered burns on his shoulder, neck, face, and both of his feet. Corporal DeWeese was treated in the emergency room and later moved to the burn unit at Shands Hospital for further treatment. He was conscious, alert and responsive at the hospital. All of Corporal DeWeese’s family were notified and responded to the hospital. A Trooper was assigned to the hospital with the family. Corporal DeWeese is in good spirits, and his wife Karen and family are with him. He is still in the burn ward at Shands Hospital in Gainesville, and most likely will be for a few days to undergo more tests. The Doctors are evaluating the burns he received from the lightning, and will make a decision this week as to how they are going to treat those wounds. ALL of his tests so far have come back OK, which is good news. His heart was not damaged, and his kidneys are normal, which show Tony was not overheated internally as a result of being struck by the lightning. Let’s all wish Tony a speedy recovery!